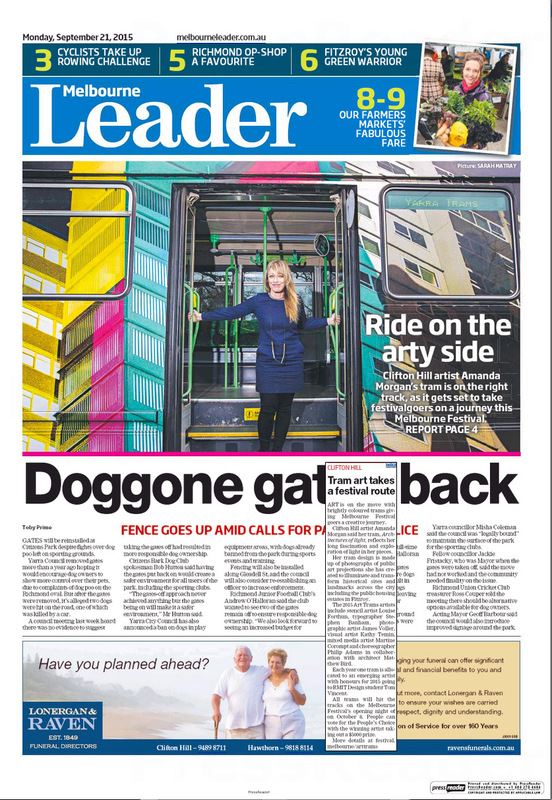 ‘Let There Be Light’ Font page full page image, the Age, Sunday February 21, 2016. Sally Bennett ‘Melbourne You Shine Bright’, News, Herald Sun p6-7, Sunday February 21, 2016. Stephen McKenzie, ‘Decent Exposure’ The Weekly Review, Sunday February 21, 2016. ‘White Night Melbourne’s curated trails’ Arts Review, February 21, 2016. Sally Bennett ‘White night a Huge Success’, with time-lapse video of project, Arts online, Herald Sun, Sunday February 21, 2016. Debbie Cuthbertson, ‘White Night Melbourne 2016: …Unexpected encounters’, The Age Entertainment, Sunday February 21, 2016. Kirsty Simpson, ‘Hang’em High’, The Herald Sun, 10 Oct, 1992. Max Delany (ed. ), ‘Slave Pianos | Punkasila | Pipeline To Oblivion: 3 Projects By Danius Kesminas and Collaborators’, Monash University Museum of Art, Melbourne, 2011, p.19, 58, 72-73. Brendan Lee, ‘Time Machines’, Seeing to a Distance - Single Channel Video Work From Australia, Level 17 Artspace, 2011. Darren Tofts, ‘Tales from futures past; the lessons of Lemmy Caution’, Seeing to a Distance - Single Channel Video Work From Australia, Level 17 Artspace, 2011. Ashley Crawford, ‘U-Turn’, Glendale College Gallery, Los Angeles, USA, 2007, p.36. Larissa Hjorth, ‘Organic Chocolate’, Process Colour, Conical, 2003. Kate Shaw, ‘Preaching to the Converted’, Homeloan, Caroline Springs, Melbourne, 2003.